So blocking people on Facebook is never a crime. But it's one of the basic ways Facebook account holders attempt to safeguard their profiles and information from unscrupulous persons. However, when you unblock someone on Facebook, you'll need to send them a friend request for them to accept you. That reason for that is, unblocking doesn't befriend you with the person automatically. 5. Next, you'll need to scroll down to the "blocked users list." 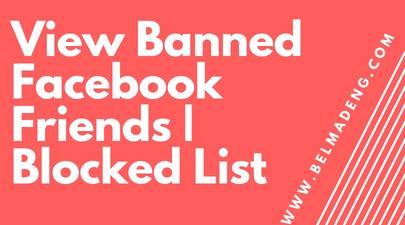 On that list, you can see all the persons you've blocked so far. Note that you'll a message like "you've not blocked people" if that is the case with you. To unblock a halted or a blocked user, you'll need to click on the unblock button that is next to the name of the person you wish to unblock.